Welcome to a week of fantastic collaboration between IMAGINE Crafts and Magenta Rubber Stamps! Both companies are excited to share with you their products, from the latest inks from IMAGINE Crafts to the newest Fall and Holiday stamp releases from Magenta. This is my first holiday design of 2014! No doubt there will be more. Step 1 – cut a 4″ x 5.25″ card and stamp branches with Luxe Northern Pine and edge with Brilliance Pearlescent Poppy. Spray with Frost Sheer Shimmer Spritz. Step 2 – stamp ‘joyeux noel’ on scrap of paper with Pearlescent Poppy and clear emboss, cut down to size and edge with Pearlescent Poppy. Step 3 – Punch small circles from shiny red paper and adhere to various ‘berries’ on card. Center ‘joyeux noel’ on card and adhere with dimensional tape. Add silver string and adhere edges to back side of card. Layer front card with red paper, then adhere to card. You could also add some shiny embellishments to add a bit more ‘frost’. 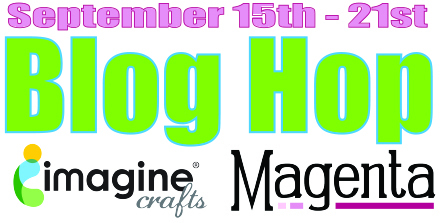 IMAGINE Crafts and Magenta are offering a total of three different prizes this week as part of this Blog Hop. These prizes include IMAGINE Crafts’ irRESISTible Texture Spray, irRESISTible Pico Embellisher, Delicata Shimmery Silver and Golden Glitz AND some of the newest releases from Magenta. Take a moment to visit the other featured artists’ blogs listed below and leave a comment on their posts by midnight PST September 21st. Three winners will be randomly selected from three different blogs from the seven days of the Hop, with one commenter from each blog draw as the winner. Blog Hop Hint; if you click on a link that takes you to a page saying something like, “Sorry this page cannot be found” just click on the header at the top of the blog (usually a picture, or the blog’s name), and it will take you to that blog’s most recent post. That post *should* be our hop. If not, you can probably scroll down a short way to find the hop post. Love the classy look of this x-mas card! This is so beautiful! I make Christmas cards all year long – I love all the products you used to make this! Gorgeous! Très jolie carte, très festive. What a gorgeous card! I love the stamp and the lovely colors of ink that you used. Thanks for sharing with us. I just love this stamp!! I am definitely going to be getting the branches stamp!! Your card is simply lovely!! Love the many “berries”, I think they really add so much to this card, taking it from wow to WOW! TFS! great christmas card – i love the background stamp! Neat way to make the berries. I love your card ! Very nice background with the stamp ! This is just beautiful. Love the background effect of this card. Gorgeous card! I love how you attached the sentiment. A beautiful car. The background effect is lovely. Thanks for sharing. Maureen, this is such a beautiful Christmas card. I’m thinking about using that same Magenta stamp the same way for Thanksgiving cards. Love it! Gorgeous card! Love that pretty Luxe Northern Pine color (have to shop for that pad!) on the beautiful branches stamp! Love the detail of the beautiful red berries too! What a wonderful way to use that stamp!! Beautiful card! Gorgeous card. Love all the shimmer and shine! Can’t wait to try this card. What a pretty card. Love the pop of red. LOVE your ELEGANT design, the branches are so pretty, especially with the POP of the red rhinestones, LOVE the sentiment and how you have attached it too!!! The delicate stamping on the white background really captures the feel of the season. The little red berries are just the right extra touch and I love how the sentiment panel is tied on like a suspended sign. Excellent card. This card is so pretty! I love how the punched circles look! Love this branch stamp. Thanks for sharing. I really love this card. Those branches are gorgeous.